Africa has long produced strong players, but lack of exposure and training resources prevented many from reaching their full potential. Manuel Mateus and Pedro Aderito of Angola earned their IM titles at a young age, but their talents have gone largely unnoticed. IM Watu Kobese has also struggled to find avenues for training and exposure. The three listed players below are special in a sense that they are immensely talented… rough-hewn diamonds in need of polishing. Hopefully, they will continue to work hard in an effort to realize their respective potential and become Grandmasters of tomorrow! Amon is an extremely talented player. After his meteoric rise in 2000, he has slowed considerably after becoming a university student at the University of Texas at Dallas (USA). The holder of two GM norms, he has a bold style and takes tremendous risks in double-edged positions. 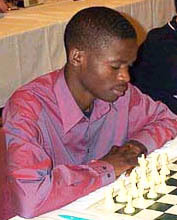 The "Zambezi Shark" has been praised by many strong players on the international circuit. The main question is whether he will get the training to realize his immense talents. A whirlwind of action and bursting with talent, Gwaze is arguably the most exciting player in sub-Saharan Africa. His 9-0 score at the Bled Olympiad won the gold medal and caused the chess world to take notice. The two-time African Junior Champion appears to relish complications, is deadly on the attack and is full of determination. 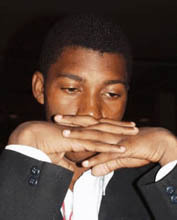 The well-spoken young man recently competed in the British Championship and is seeking other strong tournaments. Solomon has nerves of steel and can be characterized as being as a fiercely relentless player. A Sveshnikov loyalist, he relishes active piece play and thrives on wresting the initiative away from his opponent. One trademark of Solomon is his ability to go the full seven hours. 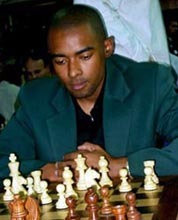 At the Wilbert Paige Memorial, his nine games averaged 62 moves! Kenny will reveal his talents at the upcoming African Championships as the South African Closed Champion.